The customer is pre-disposed to buy via online and search channels, going forward. Nothing wrong with that. But your email marketing team, well, they care, they care deeply about getting the customer to buy via email marketing. Nearly eight in ten subsequent purchases would happen via online/search, if the customer were allowed to buy online. However, your email marketing team want the next order to happen via email marketing. They crave it. They're going to make it happen! And when they make it happen, they change the trajectory of future customer behavior. There are two things worth noting, in this example. 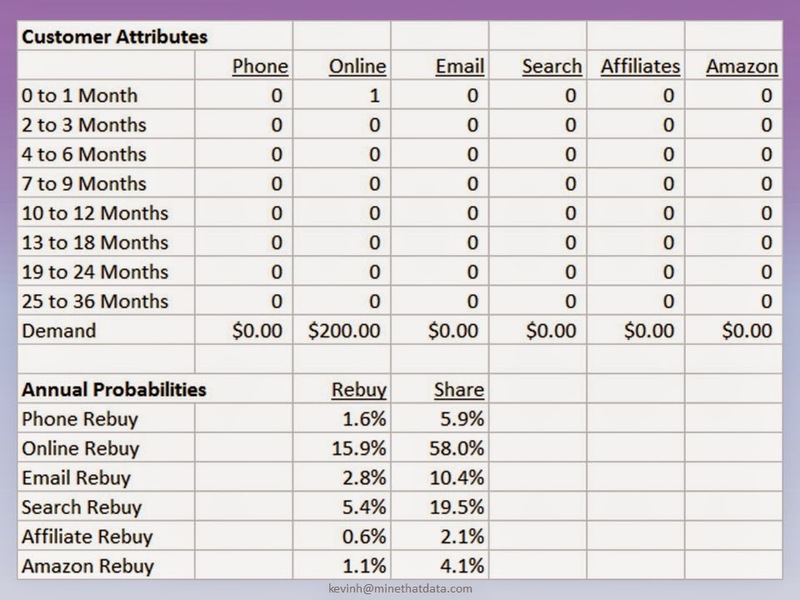 First, when evaluating share of future spend, we observe that share has been shifted - away from the online channel, more into the email channel. Going forward, email is going to be more important to this customer. 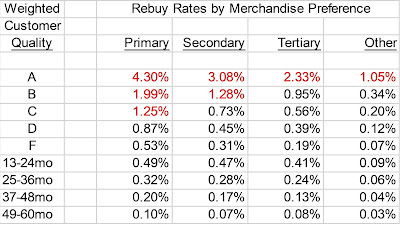 Second, and more important - look at the individual row-based repurchase rates by channel ... what do you see? Clearly, the customer is more valuable now. 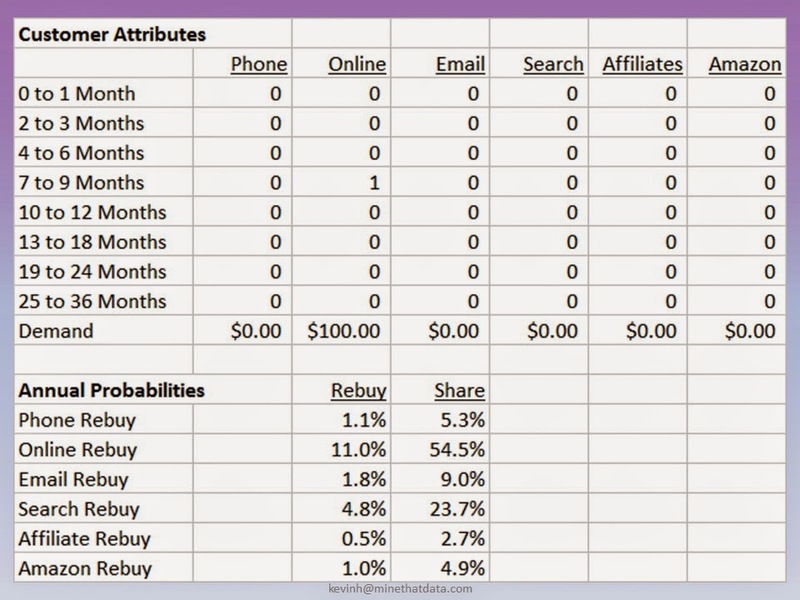 Email, in this case, caused the customer to simply become more valuable to the business. 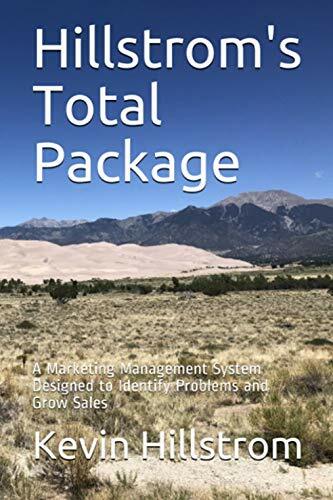 For this business, you want the email marketing team aggressively going after customers, because when the customer buys from email instead of the online channel, the value of the customer simply improves. Your business is a big, bubbling ecosystem. You are not "omnichannel", you are an ecosystem ... and within the ecosystem, there are good choices and there are bad choices. You want to pursue good choices. In this case, email represents a good choice. Contact me (kevinh@minethatdata.com) for your own, customized triggers & grids project.